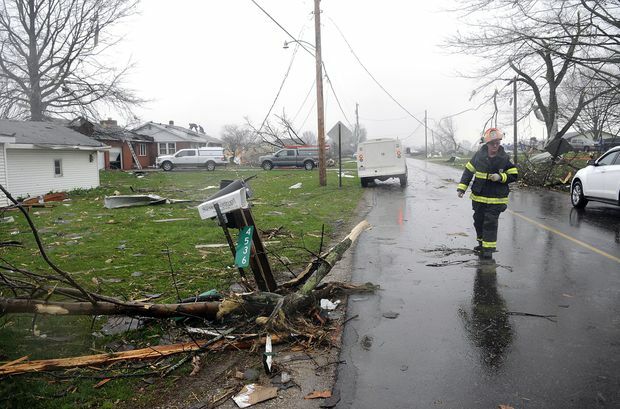 World Deadly storms leave thousands without power in eastern U.S.
A Shelby firefighter walks down Plymouth Springmill Road just south of the intersection of Ohio Route 96, past severe storm damage to homes in Shelby, Ohio, on April 14, 2019. More than 79,000 homes and businesses were without power in Virginia, according to the tracking site PowerOutage. US, with 89,000 more outages reported across Pennsylvania, North Carolina, Michigan, Maryland and New York. Nearly 2,300 U.S. flights were cancelled by Sunday evening, more than 90 per cent of them at airports in Chicago; Houston, Texas; Charlotte, North Carolina; Pittsburgh; Columbus, Ohio and a dozen major airports on the Eastern Seaboard, according to FlightAware.com. The storm’s cold front brought snow to Chicago on Sunday, with 1 to 3 inches (2.5-7.6 cm.) reported in central Illinois. A third child, Sebastian Omar Martinez, 13, drowned late on Saturday when he fell into a drainage ditch filled with flash flood waters near Monroe, Louisiana, said Deputy Glenn Springfield of the Ouachita Parish Sheriff’s Office. In another storm death nearby, an unidentified victim’s body was trapped in a vehicle submerged in flood waters in Calhoun, Louisiana, Springfield said.